If you’re like us, you can’t wait to get your camper opened up for the camping season! (If you have not already done so.) In fact, we’re so eager we’ve compiled a checklist of items for you that will help you have a smooth, hassle-free camping season this year. Everyone who RVs should utilize a check list, like the one below. An RV checklist will help you open up the camper for the coming camping season, as well as when you put the camper away for the year. The list below should be done while you are at home, doing so will allow you to enjoy a trouble-free camping trip. Make sure the batteries are fully charged and installed correctly. A bad battery can make for a bad camping trip. Wash the exterior of the RV. Do a sealant inspection and repair as necessary. Connect your tow vehicle to the RV and test all connections and lights. This should be done every time you hook up to tow. Some of the above items should be looked over a couple of times a year. We recommend having your RV thoroughly checked when you have your required state inspection completed. Preventative RV maintenance will allow you to enjoy a trouble-free camper for many years to come. Autumn camping, is camping at the best time of year. With the arrival of autumn, comes fall foliage and football. Cooler weather and shorter days are on their way, but that doesn’t mean that your camping and RVing fun has to end. Fall is a great time plan a camping trip to destination hot spots that may have been too busy during the summer. In the fall campgrounds and parks are less congested and rates are usually reduced. 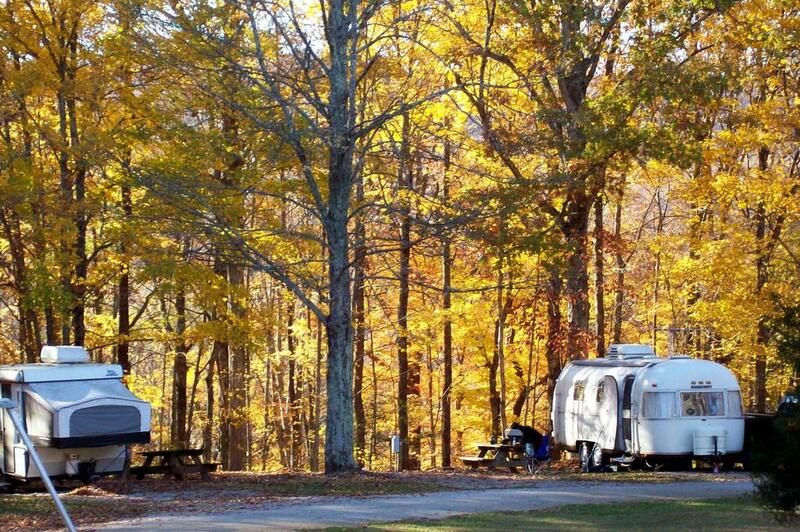 Many campgrounds offer kids of all ages fun, autumn inspired activities. Consider a fall color tour while camping — from mid-September to late October the autumn foliage colors can be spectacular. To help you plan your fall color drive or nature hike near your destination, check online for tour dates and maps that list the best locations to view the changing fall colors. Fall is the perfect time to visit orchards, farms and markets throughout the country. Cider mills and apple orchards are usually busiest during the fall months, offering fresh apples, cider and doughnuts. Check for farms near your campground that offer corn mazes, wagon rides and pumpkin picking during the fall months. Or find an enjoyable scenic railroad that offers a nice leisure fall inspired scenic trip. With autumn’s arrival comes the tailgating season. Besides the excitement watching your favorite college or NFL team play, the tailgating tradition allows you to enjoy some leisure time with family, friends or complete strangers, before you enter the stadium. Tailgating in an RV is an experience that just may spoil you and your guests for life. Besides having a roof over your head in case of bad weather while tailgating, most RVs have a bathroom allowing you to skip the porta potty lines and a refrigerator to keep your food and beverages cold. After the game, forget about sitting in traffic, fire up the grill for some hot dogs or hamburgers, watch game highlights on your TV or play some games until it’s time to leave. Sooner or later, the cold weather will approach and many of us will be winterizing our RVs. So get out there and enjoy the fall camping season before it is too late. 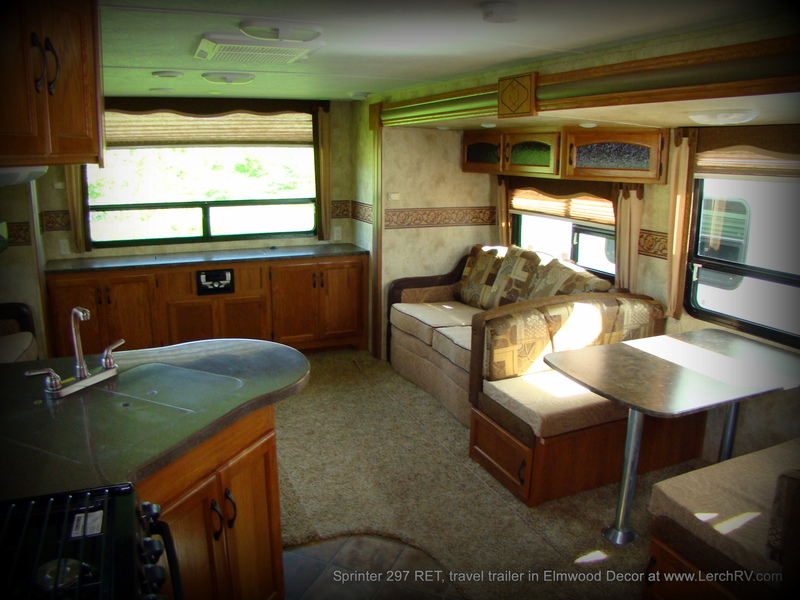 Are you looking for a new RV in Pennsylvania? Are you looking for a great balance of storage, living space and sleeping capacity? And are you looking for a great price on your new RV? The Sprinter 297 RET reflects Keystone RV’s efforts to make your camping weekend as easy and enjoyable as ever. The Sprinter 297 features a fully enclosed and heated under-belly, an adjustable power A&E awning, motion detector porch light, day/night privacy shades, a home theater system with LCD TV, and dual air mattress sleeper sofas, among other great features. A full one year manufacturer warranty. However the best feature of this exciting travel trailer just might be the price; $22,200. That is a savings of over $3,000. Come see how Pennsylvania’s largest Keystone Sprinter dealership “Makes Buying Easy”!